I’m an introvert. I’m at my best and most productive when alone in my home office, save for a cat coworker. Alone time provides me an opportunity to recharge my batteries so I can get more done in a day without feeling burned out. But, that’s not to say I don’t enjoy interacting with others. On the contrary. Time with friends is something I look forward to. That sentiment holds true for many of the introverted among us. In fact, a lot of introverts can pass for extroverts. And there are those who don’t even realize they are technically introverts. Are you an introvert and don’t even know it? Here are 23 signs you’re secretly an introvert. Introverts often get a bad rep as being antisocial or disinterested in others. But as I mentioned before, there’s more to introversion than liking or disliking the company of others. Think of introverts as being “inward thinking.” That is, they are focused on their internal thoughts and feelings. Introverts don’t gain energy from being around others. Extroverts do. An introvert may very much enjoy being around a group of people, but will need ‘alone time’ afterward to reset. That’s why many introverts may benefit from a work from home career. They don’t have to continually interact with their coworkers or attend daily meetings as a remote worker. This means more time for working and less time recharging after a draining day on the job filled with meetings and general small talk that goes with being around others. Plus, while not universal, introverts tend to have a set of traits that make for outstanding remote workers. According to Very Well, one of the classic signs of an introvert include a preference to work independently. It goes without saying that working from your home office offers greater independence than, say, being surrounded by a sea of cubicle-dwelling coworkers. But that’s not all. Although introverts might find water cooler small talk to be tedious and agendas filled with meetings mentally exhausting, they can find remote work rewarding. Not only do they spend less time draining their batteries with external stimuli, they often possess inherent traits that set them up for remote work success. Introverts don’t rely on others to get things done. Remote-friendly companies appreciate this go-getter attitude, and can count on their introverted employees to put in a full days work, even when no one is looking. Give an introvert a work goal and chances are they’ll do what it takes to achieve it. This ambition lends itself well to remote work, whether it’s as an employee or a self-starting freelancer. Remote workers aren’t micromanaged. They are given a job to do and are expected to get it done without someone hovering over their shoulder. The inherent trustworthiness of introverts often means they can be counted on to get work done, no matter what. The world of remote work is constantly evolving. And this means remote workers, whether freelancers or employees, need to be lifelong learners to succeed. Introverts crave knowledge and willingly study in order to become experts in their fields. Working from home comes with a unique set of distractions you won’t find in a traditional office job. Netflix. Pets. Neighbors. Your bed. These are all things that can make it difficult for even the most disciplined to stick to the daily work routine. But introverts often have an ability to concentrate so well that they can ‘tune’ everything else out. For an environment laced with distractions, this often means plenty of work from home productivity even when they’d rather be binge watching Season 7 of their favorite show. These are just some of the common characteristics many introverts possess that make them standout remote workers. You can check out 10 quality traits all introverts have to learn more about the awesomeness that comes with this personality type. 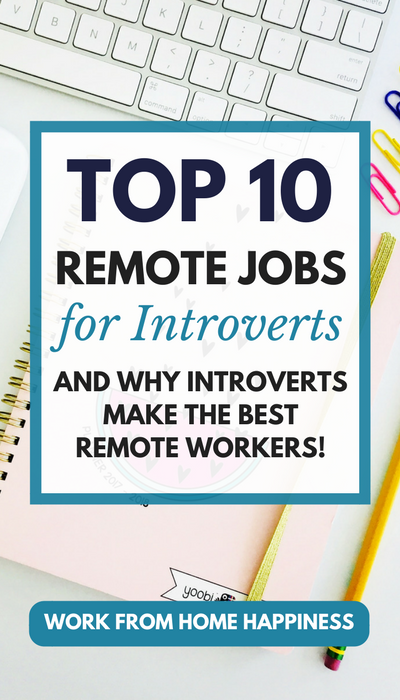 Although pretty much all remote work can appeal to an introvert’s introspective ways, there are some remote-friendly career paths that offer greater solitude than others. As an introvert myself, I gravitated toward writing not only because it fueled my creativity but offered the chance to work independently the majority of the time. I was given an assignment and a due date, and the rest was up to me. This was my ideal working situation and a stark contrast from the micromanaged, meeting-filled days I grew accustom to in the corporate world. If you too identify as an introvert but wonder what remote career path makes the most sense, check out these ideas for extra inspiration. As a self-motivated pro, introvert writers can meet deadlines no matter how tight. Writing also helps introverts express themselves better than they may be able to do orally. And with their intense desire to learn, conducting research will be no problem as they tackle new assignments. Not feeling confident in your ability to launch a freelance writing career from scratch? Start small. Aim to earn your first thousand dollars as a writer with this awesome ecourse. You know how I said introverts have laser focus? Well, that can certainly come in handy as a proofreader. Reading and re-reading text requires plenty of quiet time, an introvert’s preferred working environment. And their attention detail means even hard-to-spot mistakes are no match for the unparalleled concentration of an introvert! 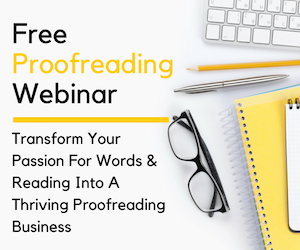 Think you have what it takes to be a pro proofreader? Take this free 45-minute workshop to find out! Did I mention introverts are good listeners? It’s true. And in the world of transcription, being able to listen is one of the keys needed to be successful. After all, transcription requires simultaneously listening to audio while typing what’s being said — no easy feat. There are a lot of transcription options out there. Two of the biggest niches are legal and general transcription. 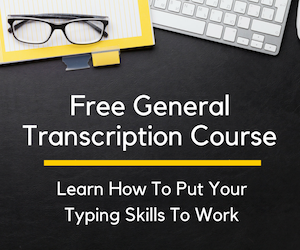 To learn more about your options, sign up for one (or both) free mini courses for legal transcription or general transcription over at TranscribeAnywhere. Web developers write code that helps bring websites and apps to life. For introverts, their attention to detail and self-motivation can help them create a successful cubicle-free career as a coder. And you can learn everything you need to be an entry-level coder for free, and open up a virtual world of remote work opportunities! Blogging exposes you to hundreds if not thousands of people each day. You’d think this wouldn’t be appealing to the aspiring remote working introvert. But remember, introverts aren’t anti-social or ‘shy,’ they simply thrive with self reflection and inner dialogue — the hallmarks of a pro blogger! Learn what else it takes to be a pro blogger in no time by reading my step-by-step, no-fail beginner’s guide to blogging. Medical billing and coding pros have to go through training to be considered a competitive entry-level candidate. And since introverts have a natural thirst for knowledge, they can master this remote-friendly skill with ease. Who would think an introvert would be the perfect person to manage anything social? But social media managers aren’t actually the ones doing the socializing. Instead, they focus on the business side of being social, which can appeal to an introvert’s methodical nature. A great place to start if you’re interested in social media management is over at HootSuite Academy. Brought to you by the popular automation tool, Hootsuite, the free courses can give you an insider’s glimpse into whether or not this is the right career path for you. Bookkeepers handle sensitive information, like financial records, regularly. The trustworthy introvert can keep this information confidential all while maintaining an accurate account of money going in and out thanks to their amazing attention to detail. Getting started as a bookkeeper doesn’t require a degree. But a little training can go a long way in helping an introvert get their own business off the ground. A good place to start is with this free three-part video series for aspiring bookkeepers. Thanks to sites like Zazzle or RedBubble, even the most introverted artists and designers can make a full-time income without having to actively ‘sell’ their work. These marketplace sites allow creatives to earn a passive income, which gives introverts the income and financial means to continue to create. You can teach yourself graphic design using Photoshop and a couple of how-to guides for less than the cost of a fewStarbucks lattes. Or use a free 30-day trial of Skillshare to jump into the elements of creating as a profession. Introverts may find it difficult to pick up the phone, whether it’s to make a call or answer an incoming one! But that doesn’t mean they’re not great at providing support. In fact, introverts are often great listeners, which means they can be an asset to any customer service team. And because many companies offer email agent and chat support jobs, introverts can put their listening skills to work, without having to pick up a phone. Of course the 10 career paths listed here are just a small sample of options for introverts. The truth is, any remote-friendly job can appeal to an introvert for the autonomy it offers. If you’re an introvert wanting to join the work-from-home ranks, you need to read my quick-start guide to finding a remote job. 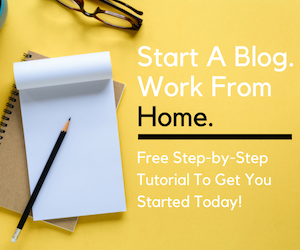 You can grab your free copy by signing up for the work from home resource library below. This is all SO. TRUE! Introverts typically don’t struggle with the isolation of remote work, which is nice. Of course, mentally some interaction is healthy so it is good advice to find other ways to socialize occasionally. Thanks for a great post! Thanks for sharing these work-from-home jobs for introverts. Being an introvert myself – blogging was easy – at first. Since I’m a private person by nature, it was hard to get out there and post selfies, share what’s going on in my life to connect with my audience. That can be overwhelming for an introvert. But blogging made it easier for me to get out there and be social. Thanks for sharing these suggestions! Definitely passing this on. Have a great day and weekend! Thanks for the list, but I have to tell you, it makes me sad that this is all there is for introverts. I don’t like any of those jobs and many of them are hard to get without experience if you want to get paid, even if you have certification or a degree. There has to be another way. Thanks anyway. Do any company you know offer free training?